We already knew the deep ocean is full of nightmare creatures — twisted amalgams of tooth, jaw and fin sprung to life from some tortured corner of the multiverse. But good news — it gets even weirder! Scientists have just learned that one deep sea predator has a flexible attachment between its head and its skull that allows it to snap its jaws open like a Pez dispenser. That’s the conclusion of a study published this week in PLOS One, in which biologists Nalani Schnell and David Johnson describe a bizarre feature of the barbeled dragonfish. The fearsome predator skulks the ocean’s dimly lit “twilight zone,” which is about 600 to 3000 feet below the surface. Measuring just a few centimetres in length, this creature is a sight to behold, with a double set of barbed teeth, a distensible stomach, and bioluminescent chin barbels for luring prey. Now, to add to the freak show, it appears some barbeled dragonfish have a rather freestyle connection between their head and their body — one that allows them to achieve a 120 degree wide, banshee - like mouth gape. “We certainly know of no other fishes with this feature,” Johnson told Gizmodo. Most vertebrates have bone-to-bone joints between the head and the neck, including us, he added. 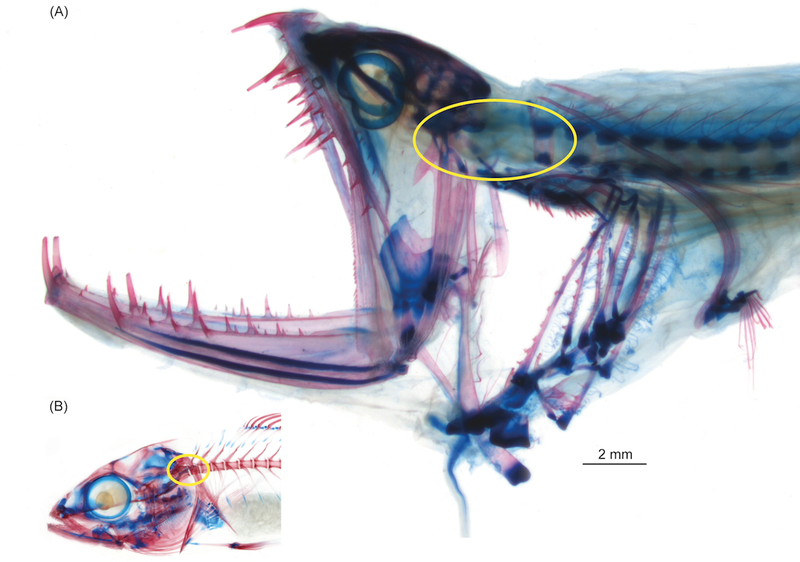 The discovery came about through Schnell’s dissertation work, which focused on the peculiar anatomy of the barbeled dragonfish’s upper vertebra. Her early research showed that these creatures have a “flexible gap” between the occipital bones at the base of the skull, and the first ossified vertebra of the neck. Within this flex region, notochord tissue — a cartilage - like material that runs through the spines of all vertebrates—lacks the typical bony outer casing. Now, through a more detailed anatomical study of museum specimens, Schnell and Johnson have learned that in at least five genera of barbeled dragonfish, the head-neck gap is actually a fully-fledged joint, one that allows the notochord “to fold like a sheet around the head,” as Johnson put it. This affords the animal a surprisingly wide range of cranial mobility — and allows it to open its jaws to horrific angles to snap up prey whole. Unfortunately, it’s nigh impossible to bring a barbeled dragonfish to the surface and keep it alive for study—their environmental conditions, including extremely high pressures found in the deep ocean, are too difficult to replicate in the lab. 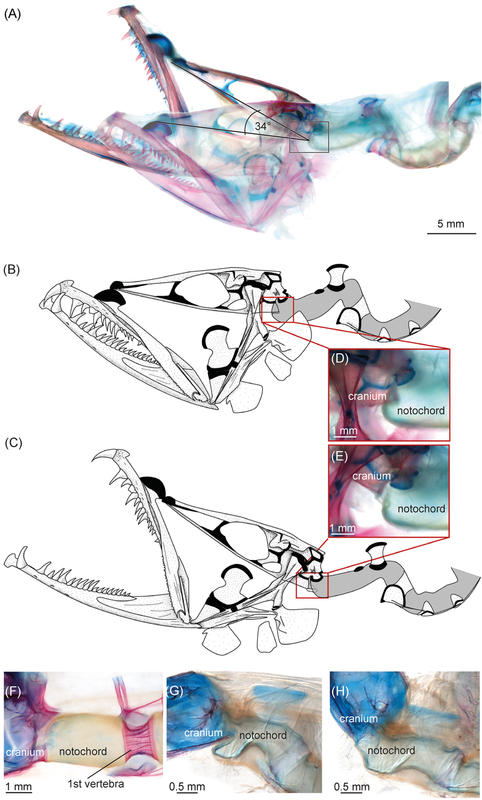 To gain more insight into how the barbeled dragonfish uses its flex-head, Johnson and Schnell now plan to study the associated muscle groups.